While we largely dodged the threatening rain on Tuesday, on Wednesday morning everybody woke up to the sound of rain hitting their tents. On this cold and wet morning, it was quickly decided to pack as quickly as possible so that we could begin hiking as soon as possible. So the first lesson of the day was how to deal with taking down a campsite in the rain–not something our troop has had the pleasure of experiencing much over the years. We did not appreciate the many challenges brought by the rain, as it soaked our gear and posed unexpected difficulties with packing away the tents, including adding extra weight to our packs. It was raining fairly hard by 7am and we were so dis-oriented by packing away in the rain that one our colleagues mistook a camera flash for lightning. This added a much needed moment of levity in an otherwise pretty uncomfortable environment. 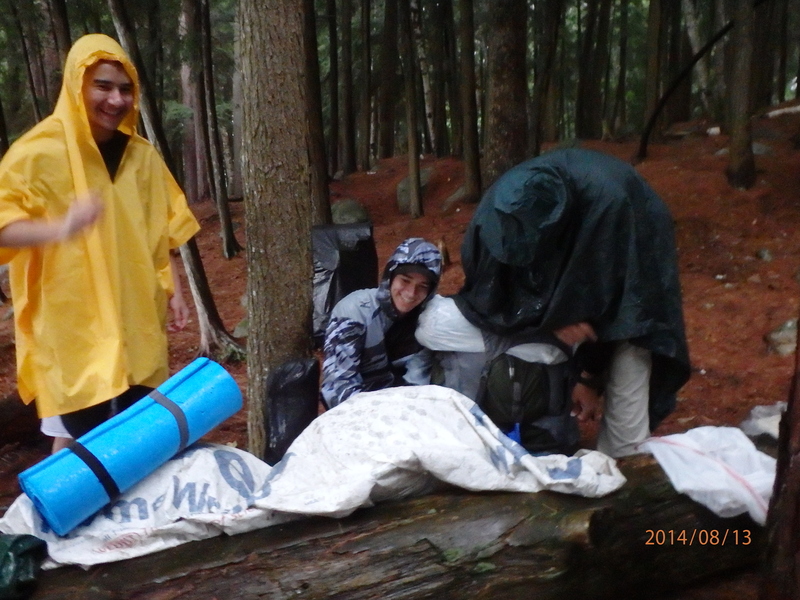 A scout is cheerful–even under extreme conditions! 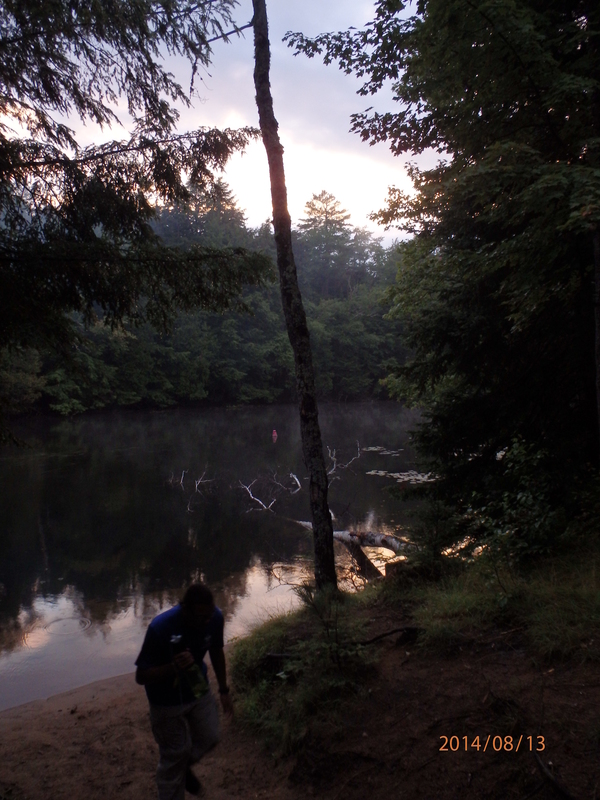 Miserable and wet, we all had a quick breakfast and headed back up the slippery +1 mile trail to the road to our pick-up point, where a truck and a trailer full of canoes was waiting to drive us +40 miles northwest to start the canoeing portion of our trip on Lower Saranac Lake. Before departing however, we needed to replenish our food supplies, shed our hiking gear & get ready for the paddling portion of our trek, so we re-organized at a local beach in Long Lake Village under a gazebo. 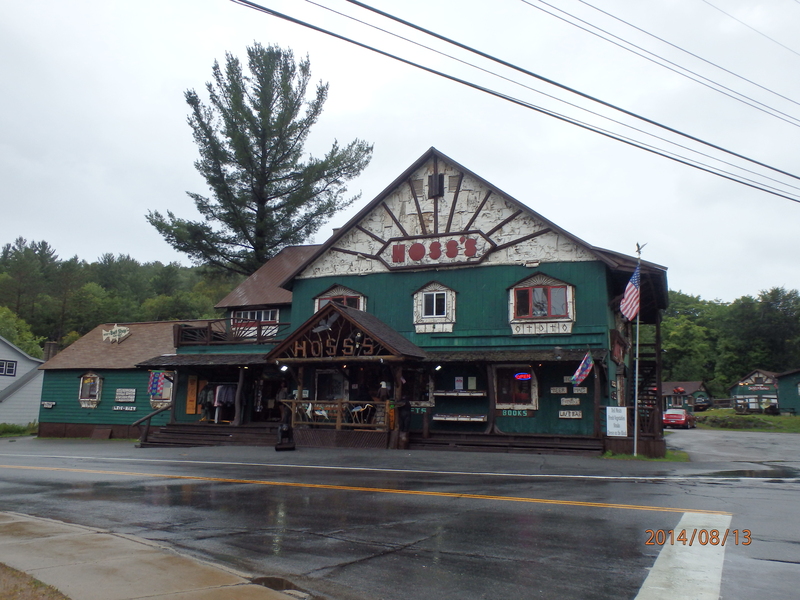 Just prior, we made a stop at a classic Adirondack camping good store, Hoss’s and Stuart’s (convenience store) where we were able to buy a warm, morale-boosting breakfast sandwich. 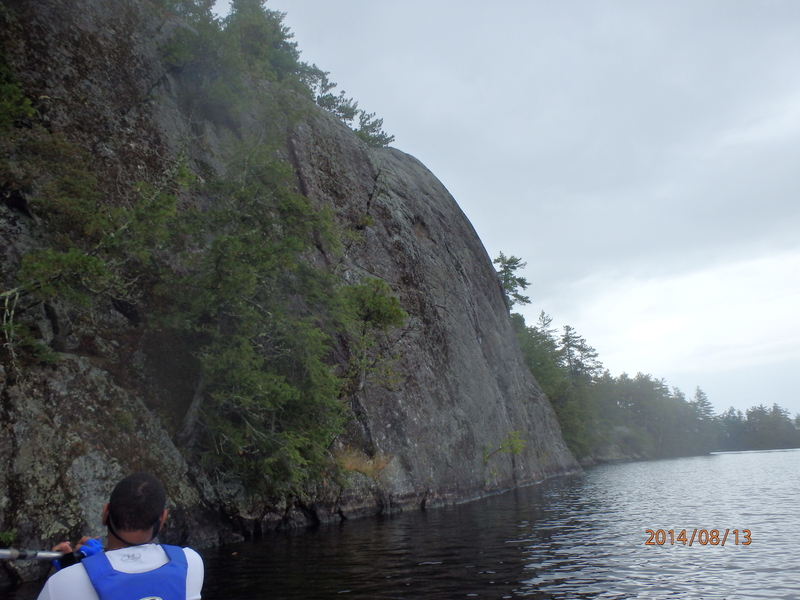 Our original input point was Middle Saranac Lake and we were to paddle up the connecting river through a canal to the southern end of Lower Saranac Lake & then up the 6 mile oblong-shaped lake toward First and Second Pond and eventually to our targeted lean-to on the river. During the long car drive, in between desperate efforts for a cat nap, our guide Kelly led us to believe that we should change our itinerary to launch our canoes much closer to our targeted lean-to campsite in order to hang up our wet gear to dry (as an updated rain forecast suggested that the rain would be letting up). 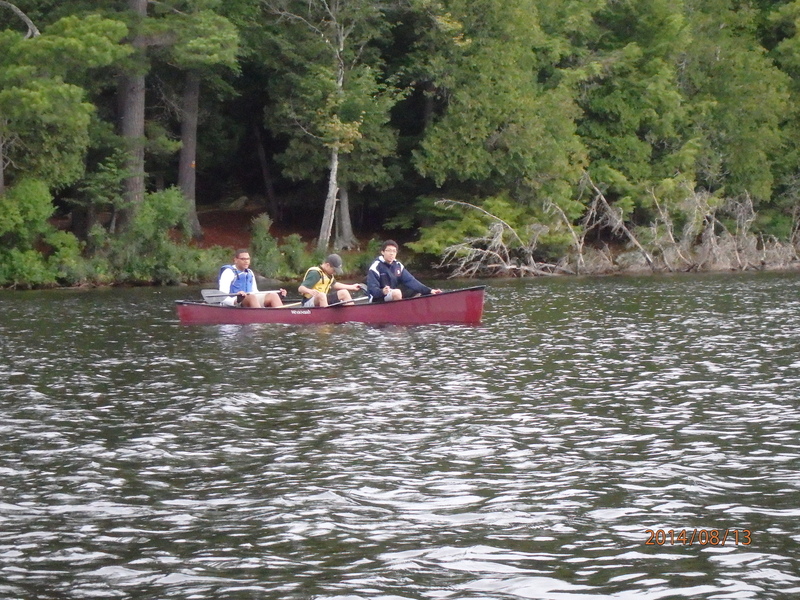 Afterwards, we could get our mileage back up by paddling around the beautiful Lower Saranac Lake, enjoying lunch on one of the many picturesque islands there. Lesson #2. After an hour+ drive, we arrived at the designated public boat launch to begin our paddling expedition. We unloaded the canoes and our gear and then headed in a southeastern direction across Second Pond down a narrowing river to our targeted riverside campsite. As soon as we entered the water, it started to rain (lightly) again, but we were optimistic that this would soon pass, and besides we were no longer carrying 50lb backpacks. How bad could this be? After a short 30 minute paddle, we made it to our campsite about a mile from the boat launch. There, we unloaded all of our gear and hung everything that was wet on clotheslines and the lean-to so that they could dry while we paddled around the lake. 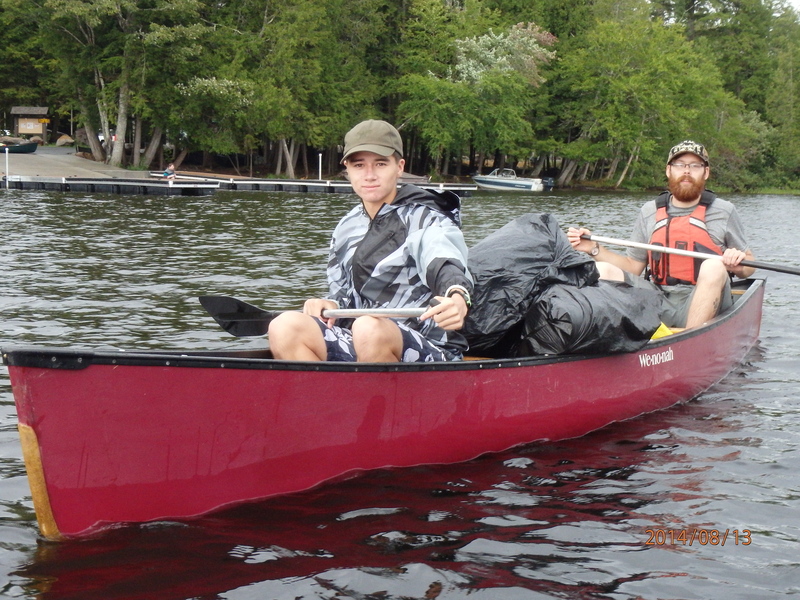 Right after this task was completed, we got back into the canoes and paddled back past the boat launch, through First Pond and eventually out to the big lake. Along the way, we observed lots of different birds, including some friendly cranes. We paddled through what seemed like a maze of small islands and the reality of how easy it would be to get lost made us grateful for our detailed paddling maps. Lesson #3. 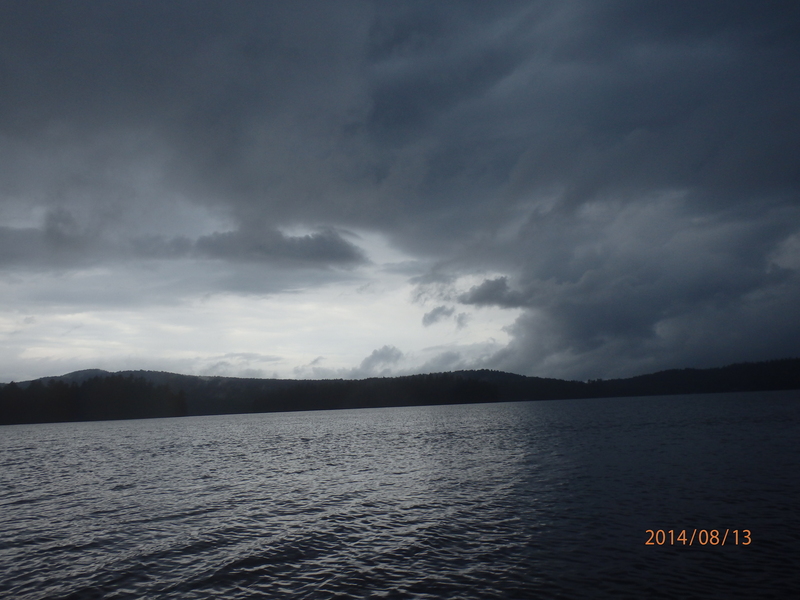 Eventually we got to the open water of the lake and made a decision to stay relative close to the shore to minimize the physical exertion that would be required to paddle against the waves and wind and to seek refuge should we hear any thunder from the still threatening skies. 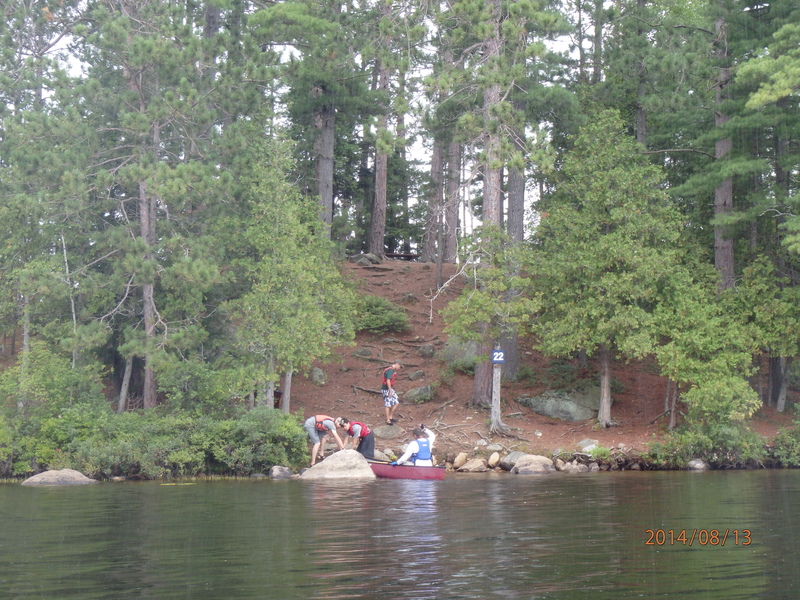 After about an hour we spied an ideal island at DEC campsite #22–time for lunch! On this small island, we relaxed, explored and enjoyed a lunch served, courtesy of our multi-talented guide Kelly. An intense discussion emerged pondering how those pesky, starving chipmunks could be present on this tiny island. We never came to consensus on this. 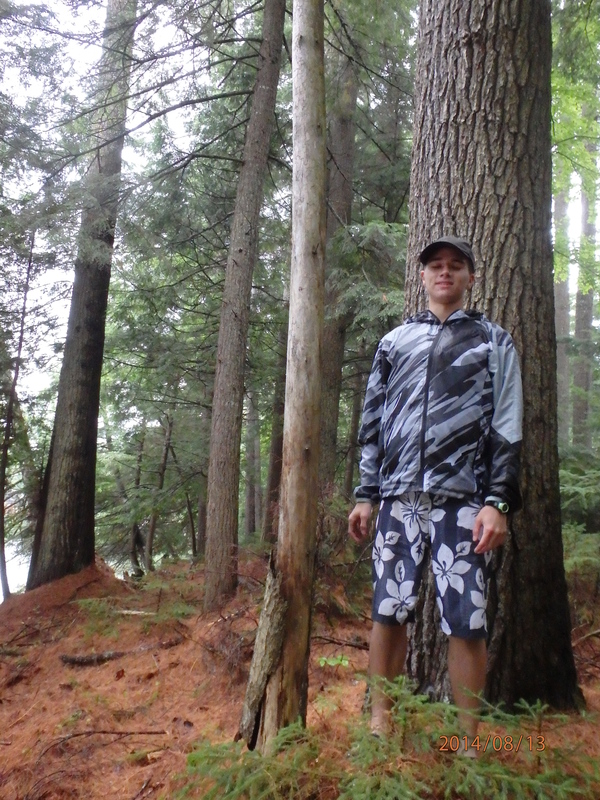 After lunch, we mapped out a paddling route and decided to do more exploration. The topography was very diverse and we saw so many interesting campsites along the way. 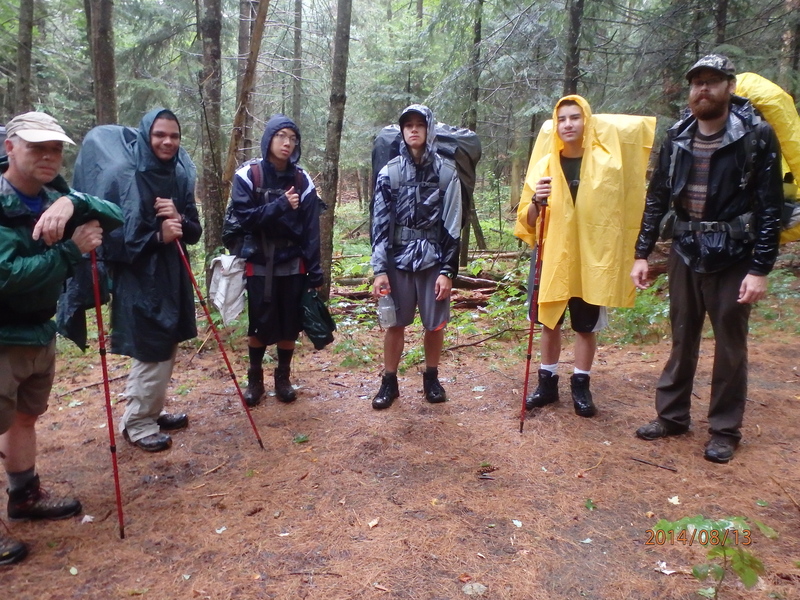 Before we made it back to our campsite, we encountered rain yet again. So we sought some refuge under some trees near shore. Luckily, it did not rain extremely hard for too long, but we were definitely soaked. At least one of our crew learned first hand why experienced outdoor enthusiasts say “cotton is rotten”. Lesson #4. By the time we got back to the campsite a few hours later, the rain had finally stopped. During our afternoon paddling expedition on the lake, Mr. Wauchope decided to stay behind to watch our gear and, unfortunately, complete some mandatory work for his job. When we returned, we found our gear was indeed safe, but it had been impossible to bring all the gear inside the lean-to, so much of it was still hanging up…and still very wet. 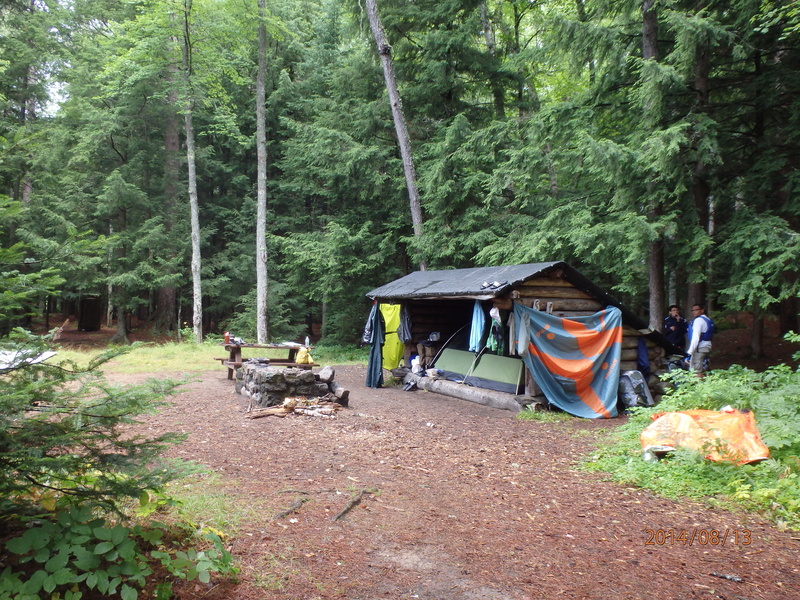 Unfortunately, it was also discovered that Kelly’s backpack was left open outside of the lean-to and his bedding and all contents were soaked. Uggh! Tensions rose and the scouts soon learned about how to manage group dynamics when unpredictable events occur. The wet gear was even more problematic as the campsite was picked clean of all firewood, so we could not even start a fire to dry out! They say “Necessity is often the Mother of Invention”. At some point the group decided to look for wood on the other side of the river, where there was ample firewood. So an important excursion was made across the river. Finding a landing spot was tricky and very muddy, but once ashore it was easy to find enough wood to fill our canoe. A few wood gathering trips yielded quite the bounty! 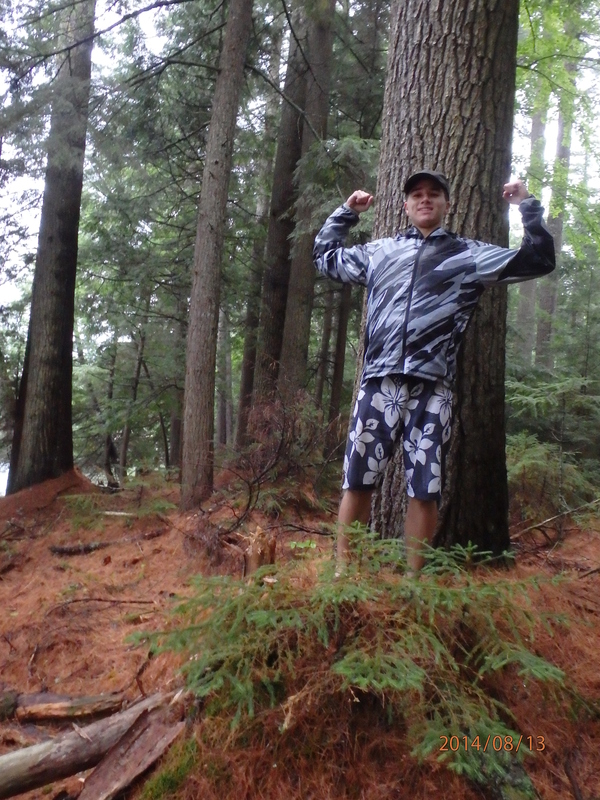 One of our scouts took great pride in pushing over a dead tree at least 20 feet high! Now with plenty of dry firewood, we began the process of drying out our clothes and, importantly, Kelly’s sleeping bag! 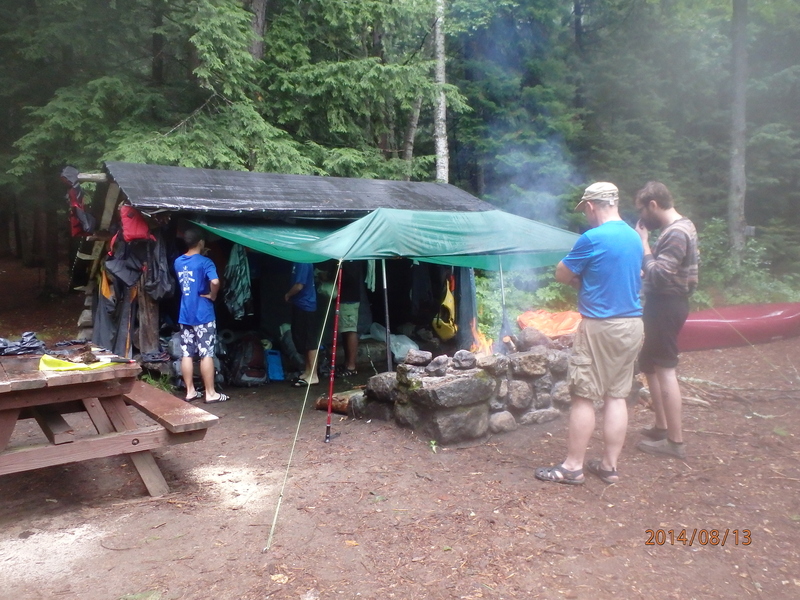 We were able to attach a tarp to the front of the leanto and used hiking poles to bring the front edge of the tarp near the fire, creating a convection oven effect inside the lean-to. Slowly but surely, the redirected heat from the fire began to dry out all the gear! Tensions eased. Lesson #5. Later that afternoon it looked like the sky was finally clearing. With full stomachs and water bottles, as the night pulled in, we all stood around the fire drying off our clothes and we reflected on both the rugged beauty of our surroundings and how we overcame multiple challenges due to the atrocious rain. We fell asleep to cooling temps & a symphony of nocturnal wildlife calls. Tomorrow was going to be a brand new day! From a Scout Leader’s perspective, many valuable lessons were learned today–this was turning out to be a great high adventure trip!